Box Office > New movies in theaters – The Hummingbird Project and more! 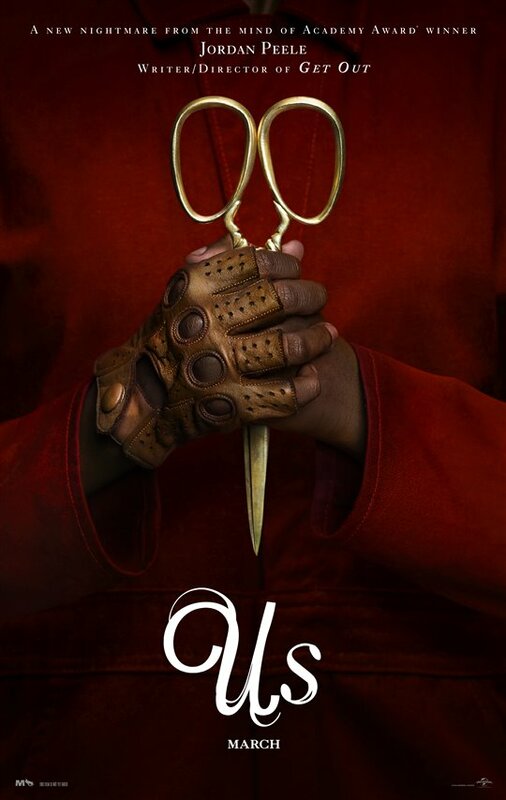 Audiences have been waiting for Jordan Peele‘s next movie, since his debut film, Get Out, was such a huge hit that it received rave reviews from critics and audiences alike, not to mention four Academy Award nominations and a win for Best Screenplay. Us – Gabe (Winston Duke) and Adelaide Wilson (Lupita Nyong’o), along with their two young children, head out on vacation to their family beach house. While there, they spot another family lurking in the shadows and soon realize the strangers look and think exactly like them. It becomes clear these doubles aren’t going to stop until they kill the Wilsons, or the Wilsons kill them. Click here for showtimes. The Hummingbird Project – High frequency traders Vincent (Jesse Eisenberg) and Anton Zaleski (Alexander Skarsgård) come up with a way to get stock market quotes in milliseconds, which could earn them a cool half million dollars in one year alone. However, their old boss (Salma Hayek) knows that the two are scheming and prepares to ruin their plans. Click here for showtimes. Ash is Purest White – Qiao would like to settle down with her mobster boyfriend Bin and raise a family. Bin doesn’t see that as a possibility, because their lives are too unpredictable and dangerous. When they’re ambushed one night by a rival gang, Qiao takes Bin’s gun and fires it, but when the police arrive, they’re both arrested. She takes the heat for him, which lands her a five-year prison sentence. When she’s released, she finds Bin has moved on with another woman and seeks revenge. Click here for showtimes. Opens in Toronto, Vancouver and Montreal. Opens April 5 in Edmonton and April 12 in Ottawa. The Mustang – Roman (Matthias Schoenaerts), a convict in a rural Nevada prison who struggles to escape his violent past, is required to participate in an “outdoor maintenance” program as part of his state-mandated social rehabilitation. When he is accepted into the selective wild horse training section of the program, he finds his own humanity while gentling an especially unbreakable wild mustang. Playing in Toronto. Click here for showtimes. The Highwaymen – When the full force of the FBI and the latest forensic technology aren’t enough to capture notorious criminals Bonnie and Clyde, two former Texas Rangers (Kevin Costner and Woody Harrelson) must rely on their gut instincts and old school skills to get the job done. Opens March 22 in Toronto and debuts March 29 on Netflix. Click here for showtimes.